On days like these, my tears worsen the waves you created in me. I woke up this morning with dreams of you calling to me like mocking birds during the winter. Swimming to an imagination that was once ignore. The idea that bees only sting those who deserved it. And that lady bugs only grant good luck to those who don’t need it. I forgot what happiness was when you looked at me. And I forgot what sadness felt like when I danced to my own thoughts in the rain. I’ve just been ignoring it to satisfy those around me. He loves me, something I didn’t know could exist so purely. Who am I to push away a rose that smells so sweet? A fool who can’t see joy without pain. A mule-walking through empty deserts filled with broken promises. Promise me this one thing: If I go, remember me in my purest form and shame those who loved me when it was convenient. Promise you’ll love me until the sun rises- then continue on with your life like you did before you knew I even existed. Because deep down, you know it’s me whispering goodbye and hello to you at the same time. 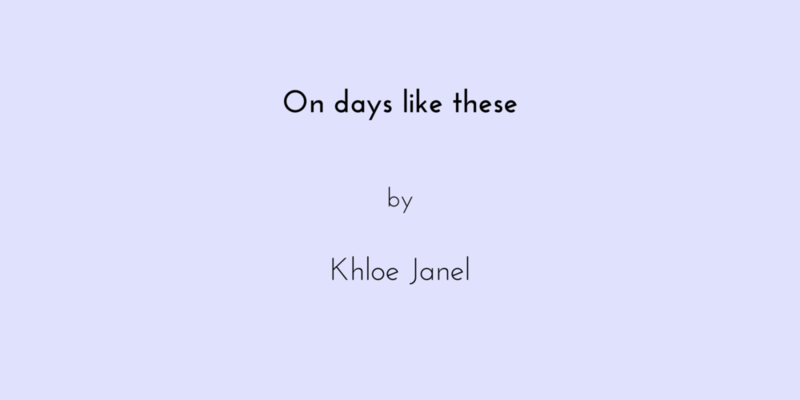 Khloe Janel is an award-winning poet, actor and singer from Little Rock, Arkansas. She has read her poetry all over the city and has appeared in several Television and Theater productions as well. You can catch her poetry reading series every week on her YouTube channel. You can also find her on all social media platforms at Khloe_Janel. More information about her work can be found at Khloejanel.com.